State Capitol, urging lawmakers to pass a Law Enforcement Reform package. Over one hundred people formed a circle in the Capitol Rotunda, singing Civil Rights songs adapted to address the issue of police violence. “We are determined to aid our legislators and our state officers in the discharge of their duty by doing more than complaining about what’s wrong, but by proposing serious solutions,” Francys Johnson, President of Georgia’s NAACP chapter told the crowd. As previously reported by Atlanta Progressive News the Law Enforcement Reform package, introduced by State Sen. Vincent Fort (D-Atlanta) and others, includes bills to restrict “no-knock” warrants, increase criminal penalties for hate crimes, require police to wear body cameras, assign special prosecutors to cases of police homicide, and repeal Georgia’s “Stand Your Ground” law. Sen. Fort also plans to introduce two more bills to the package. They would require law enforcement agencies to report data on civilian deaths and to demilitarize their operations. “Make no mistake about it, this Law Enforcement Reform package is not against policing. We support the many many police officers across this state who serve and protect their community… But there are too many officers who believe that they are indeed an occupying force within our communities,” Johnson said. 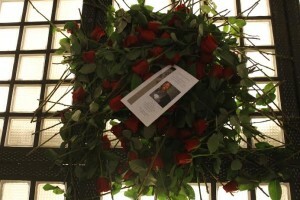 Organizers distributed 168 roses to represent the known cases of 168 Georgians who police have killed over the past ten years, a figure determined by Atlanta Progressive News in a recent feature article. They invited participants to place them in the middle of the circle. A funeral program for Kevin Davis was placed atop the roses. Davis, 44, was shot by Dekalb County police in his home on December 29, 2014. According to the Davis family’s lawyer, Mawuli “Mel” Davis (no relation), Kevin Davis had called police for help after a house guest stabbed his girlfriend. When police arrived, Davis and his girlfriend were in their bedroom. The officers did not announce themselves; instead, they shot Davis’s dog. Thinking the stabber had returned armed, Davis exited his bedroom with a gun. The police shot him on sight and arrested him for aggravated assault, despite the girlfriend’s explanation that Davis was not a threat. He died two days later in police custody. “We were not able to see him in the hospital. They kept him from us until he was already passed on,” Delisa Davis, the victim’s sister, told the crowd. The Davis family is calling on the Georgia Bureau of Investigations to open an investigation into Kevin Davis’s murder. Sen. Fort spoke at the event and suggested there is bipartisan support for the Law Enforcement Reform package. “I’ve been on the telephone with folks that I call the unusual suspects. Folks you don’t expect to be standing with Francys Johnson, folks you don’t expect to be standing with Moral Monday Georgia… Very soon you will have an opportunity to stand with folk from a broad spectrum of Georgia politics,” Sen. Fort said. Other speakers included a representative from Raise Up ATL, Atlanta’s low-wage workers movement, who spoke about the impact of harsh policing on workers; and a young woman active in the Black Lives Matter movement, sparked by the police killings of Michael Brown in Ferguson and Eric Garner in New York. Earlier in the day, Moral Monday members delivered petitions in support of the reform package to the offices of many elected representatives. They also sought meetings with Gov. Nathan Deal, Lt. Governor Casey Cagle, and Speaker of the House David Ralston (R-Blue Ridge), none of whom were available or willing to meet. In addition to the Law Enforcement Reform Package, Moral Monday has plans to take action on Medicaid expansion, public education, living wage and other economic justice initiatives, immigration reform, and equality for LGBTQI Georgians. “We went to jail last year and we will go to jail this year,” Rev. Johnson proclaimed, referring to the 73 Moral Monday activists arrested for participating in civil disobedience during last year’s 2014 Legislative Session. Sources had told Atlanta Progressive News that there would be civil disobedience at this rally, but organizers apparently changed their minds this time. A candlelight vigil for Kevin Davis will take place outside the DeKalb County Courthouse tonight, Thursday, January 29, 2015 at 6pm.